You are welcome to visit Heidi’s stand. 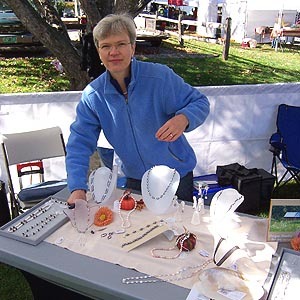 She will gladly show you her latest creations and answer questions you may have. Because you buy directly from the designer, her prices are affordable. 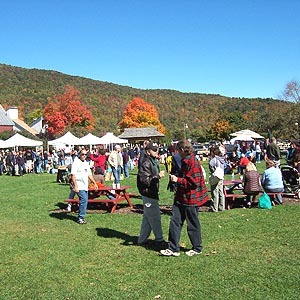 The Waitsfield Farmers’ Market is a meeting place for locals and tourists in the Mad River Valley. Running from mid-May through mid-October each year, the market offers on Saturday mornings the finest organic vegetables, flower bouquets, breads and pies, honey, lunch foods, jams, and maple syrup. 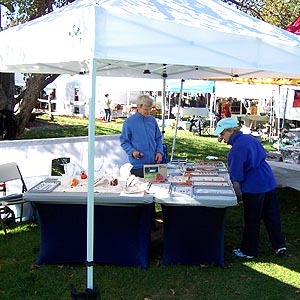 Besides farm products, the market has a diverse craft vendor base, which offers handmade clothes and hats, jewelry, handcrafted furniture, blown glass, and so many other beautiful things. You may also bring your well-behaved dogs and enjoy the live entertainment provided by local musicians.